Feelings. We live in a time where feelings dictate behavior. And it has become acceptable in our culture. Many of our youth does not seem to feel like God meant what He said. Dress modestly? I don’t feel like it and God would want me to be happy. Sexual preferences and gender identity? I feel this way and God would want me to be happy. Worship the way God says? But I feel like God would like it this way better because I can get into the service better this other way. Love your neighbor? But he has stolen from me twice and lied about it. Surely God doesn’t mean for me to love a sinner like that? 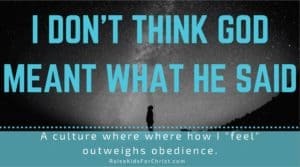 Regardless of what scripture may say, many of our youth have developed an attitude that our feelings outweigh obedience. Yes, our awesome God wants His children to find happiness, but not happiness of the world. Not a self-centered happiness, but one with a servant’s heart. Here are just a few verses of hundreds that tell us what our God expects, and selfishness is absent. In 1 Samuel 15:22, Samuel tells Saul that it is better to obey than to sacrifice. 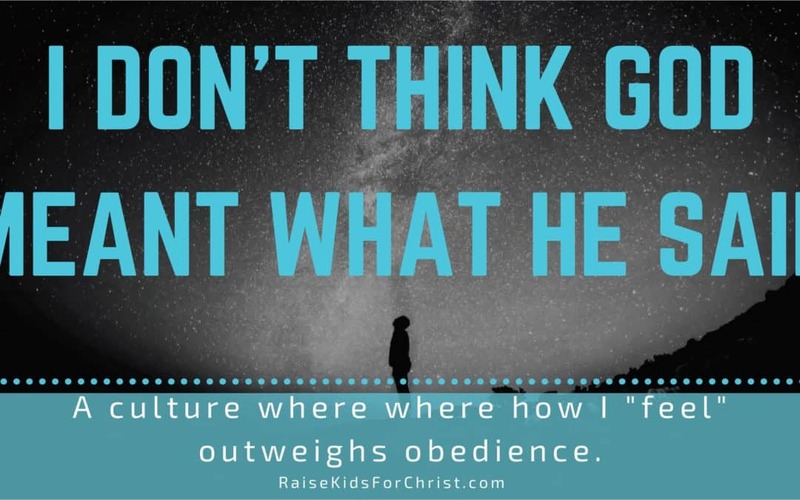 Our God wants obedience, yet our youth are more focused on how they believe God wants them to feel. They’ve made this life all about them, not God. So how do we turn this backwards way of thinking around? We have a problem, now how do we fix it? It will not happen overnight, but we can teach the next generation, our children. It’s important that we teach them how much God loves them and wants a good life for them, but this good life comes with obedience. We should reinforce often God’s desire for obedience and share the many bible stories that teach this. They are everywhere! Saul grew impatient waiting for Samuel so he offered the sacrifice before going into battle and this act of disobedience cost Saul his kingdom. Yes, we could easily see how Saul justified his decision just like we often do with our own choices today, but God expects obedience. Then there is Daniel. He chose to obey, praying to God in spite of an earthly law and God closed the mouths of the lions keeping Daniel safe. We can show this point in just about every biblical account beginning with Adam and Eve. Take the time to do this and explain to our children that it is clearly not about what we feel, but what God asks of us. Need ideas? Take a look at my curriculum (FREE) and use as is or just for ideas. (More to come.) The goal is to reach our children with the God’s Truth, teaching our kids to KNOW God, LOVE God, and SHARE God with others.